They ask Thierry if they "have the first draft of the new generation of young actors" and he replies "it's hard to say, the competition is tough. You have to make the right choices & meet the right people. Pattinson & Stewart had the chance of rising from Twilight unlike other young actors that are as talented as they are. There are in Hollywood, young actors waiting in the shadow. The market is ruthless. 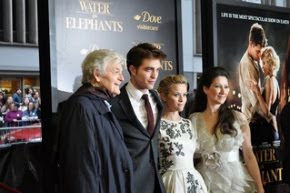 But as for Pattinson& Stewart, they're showing a remarkable maturity when it comes to their careers. And they're wonderful in both movies." The article talks about Leo Dicaprio: He managed to (almost) make people forget about Jack from Titanic. going from teenager's walls to movie-goers shelves. Will the Twilight actors be able to finance movies that are both challenging and expensive due to their names? "It's going on to depend on the success of their first steps in the 'grown up' cinema and on the power they will exercise on the screenwriter producers." continues Thierry Frémaux. "Cannes 2012 is going to show that there is a movement to go back to the "big" American Auteur cinema. They can take advantage of it, or not. All of this is so fragile. Director David Cronenberg and Author Don DeLillo mention Rob in a couple of interviews. Le Monde: This way of perceiving a script can suprise coming from an author so versed in genre movies? David Cronenberg: It is often thought that the cinema is a visual art. I think that for me, it's a more complicated combination. For me, the heart of cinema is a face that talks. It's what we film the most. I heard someone say that the last 22 minutes of the movie - where's there is only Paul Giamatti and Robert Pattinson in a room - is like theater. I don't think so. In a play, you woudln't have wide shots, movements from the camera, change of lighting. This is cinema. Without close-ups, there's no cinema. Le Monde: And Robert Pattinson? Don DeLillo: The character he plays is really close to the one in the book. I haven't seen Twilight, but I impressed my two 13 years old nieces when I told them the British Robert Pattinson was going to play in a movie adapted from one of my books. They respect me now! David Cronenberg: Casting is an occult art. It's a matter of intuition. There's objectives factors tho. The character is 28, he's american. We needed someone who would look that age and that could do a perfect American accent. The movie is partnership between France and Canada. Also, I could only use one American actor and for me, it was Paul Giamatti. I could get an English actor though. Then of course, there's the presence of the actor, he has to be able to portray a complex, crual, brutal and almost vulgar character in a way. He has to be really sophisticated and vulnerable at the same time, naiive and childish. If only to make people believe that he's capable of accomplishing so much, he needs strength and charisma. Moreover, he's in every scene. It doesn't mean he has to be handsome bu he has to be nice enough to look at for an hour and a half. And to finish, he needs to have some kind of notoriety. When a movie cost some kind of budget, you need to be able to tease your financial partners. And with all these restrictions, the list of actors you need, gets shorter. I thought about Rob pretty early on. 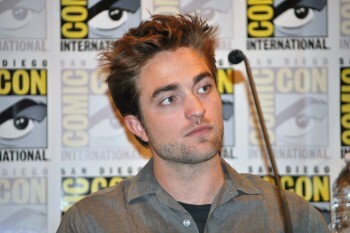 How did you feel to see Robert Pattinson, actor famous for having played a vampire in a literary creation of yours? Don DeLillo: The character he portrays is very close to that of the novel. However, I’ve never seen Twilight and when I write I have in mind neither the film nor anyone who can interpret it. I just care that it will be played by good actor. ArteTV (France) has a great new TV interview with David Cronenberg. The preview was translated by the lovely Ptiteaurel@rpattzrobertpattinson.com (Thanks!) We'll add the rest when it comes in. When you arrive in Toronto, you're likely to go to your hotel in a gangster car. David Cronenberg lives in Toronto, a clean and cold city that look likes American megalopolis. 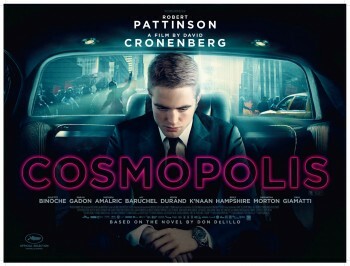 In Cosmopolis , in competition in Cannes Film Festival, is denouncong the financial world. Eric Packer, the main character, is a young billionaire and the most powerful man in New York. He's doing business in his limo and drives across the city, that's on the verge of chaos. He's adapting Don DeLillo's novel for his 20th film. David : "You have to betray the book to adapt it because if it's a literal adaptation, you're going to fail. You must accept you're doing a film and you're not translating a book. You're making a new thing. It only took me six days to write the script and believe me , it's a record. You can easily take one year to write a screen play. But here, 6 days were enough because the novel is already working as a film. The 1st three days, I just copied the dialogues without changing anything but I put it in the form of a screenplay. And then the next 3 days, I filled inthe scenes. But after I wrote down the dialogues, I asked myself if it really made a film. And for me the answer is yes. It made a really good film. However, I din't change any line in the dialogues. The character played by Juliette Binoche has just one scene in the film but it's a very long scene in the film. In the book, it's in her flat in NY but I put the scene in the limo. I thought it was more interesting to put them in a more restrained place. Because he has power, he forces people to come to him and his employees must go in his limo to see him. That's why in the scene with Juliette, I'd rather see her come to him and he doesn't come to his flat. It's a metaphor. When you're inside this limo, it's so luxurious with all these screens, these drinks, this food and there's even toilets in there. We got everything we want but we aren't in the real world. In fact, when we're in the limo , we're in Eric's mind. He's sitting in his own head. It's similar to being in a submarine, it's both hostile and foreign. It's as if he was under water and he could only breathe was inside the limo. If he gets out, he'll obviously drowns. Througout the film, he finds out he's a prisoner and he has absolutely no freedom at all. The blame is not only on the system but it's as if the system had contaminated his body. From a political point of view, we can say it's the capitalism that enslaved him. So he looks for darker and more dangerous way to be free. His wife tells him "Free to do what?. To be broke and die?" and he answers her "Yes". I began thinking about it when I was doing The Fly. I was thinking about Samuel Beckett, an irish playwright whose text are simple and austere. However beyond this austerity and simplicity, there's a big complexity. That's what's interesting for me. I've loved the cinema of many directors like Fellini. He made outgoing and voluptuous films but it's not my temper. I found my own sobriety if we may call it. A kind of austerity, an ascetism. I don't shoot very much and I do few takes. I don't multiply the angles. With maturity, you're more and more confident and we know perfectly what we want and we're more accurate. We know what's going to work. So I end up simplifying my filmaking definitively. I've always been on cautious with money but I don't understand anything. I often read financial press but the words they use are more abstract than Heidegger's philosophy. We invent money. It doesn't exist as a natural ressource. It comes from society. However , we can't control it. It has his own life and can destroy people's. So my relation with money is very simple. I don't invest money in complex . I'm not interested. I know we can deny money but I try to make it as simple as possible.